In this guide to surfing and self coaching we cover surfing best practices, how to’s & tips for new & developing surfers. Learn techniques used by surf coaches, discover common errors and clear up misconceptions. Each chapter of the guide highlights different key areas that enable surfers to develop From how to catch more waves to understanding how to judge wave height or how to duck dive, each chapter is crammed with actionable detail to help you understand and improve your surfing. In this chapter, we cover: What Makes Really Good Trimming, Carving & Bottom Turns. What is the difference between a trimming turn & carving turn? There are two basic ways of turning a surfboard in surfing: Trimming turns and carving turns. Having learnt to trim your surfboard, the more radical and advanced manoeuvre of carving turns will follow naturally. The phrase ‘trimming’ in surfing can be used in two contexts. Trimming your surfboard or moving your weight to a certain area in order to cause a reaction from the surfboard can be applied to all four corners of the board, resulting in either slowing down, speeding up and trimming left or right. An important skill to practice and hone quickly in your early stages of surfing is learning how to control your surfboard through moving your body weight in all directions. Speed up – Lean your trunk weight forwards over your front knee or foot. The more pressure that is applied the more board speed you will gain. If too much pressure is applied the nose of your surfboard will dig into the water. Slowing down – Applying pressure over your back foot or leg by leaning back will cause your surfboard to slow down. *When a long boarder is ‘Hanging Ten’ this is very advanced trimming. Another example of extreme trimming is when a surfer ‘stalls’ their board by placing a lot of their weight over the back of their board, this is often used when wanting the wave to form ahead of them. Trimming turns are when a surfer gently leans their weight over one side of the board causing the board to trim or travel in a particular direction. Preformed correctly the surfer will feel an increase in speed as the board will now match the natural pace of the breaking wave. If a surfer adds too much angle to their board the effect will be to either trim off the back of the wave (too high on the wave face) or travel towards the beach (not enough angle). When trimming along the wave a surfer should aim for their board to be up on the top third of the wave face. This part of the wave is where you can gain the most speed. Linking Trimming Turns – Linking trimming turns from one direction (left) back towards the beach and then trimming in the other direction (right) is the first sign of a basic carving turn. Trimming your board by pointing the nose of your board in the direction of travel as your paddle and take off for a wave can also be said to be trimming your board. To keep terminology clear we call this angling your board or an angled take off. HOW DO I TRIM MY SURFBOARD? Step one. Lean your body forwards slightly over your front foot to gain speed. Step two. Apply pressure and rotate your trunk weight gently in the direction you wish to trim your surfboard. Step three. Keeping your head level, simultaneously look in the direction that you wish to travel and point your leading arm in the direction you want to go. *If you are having difficulty balancing, a great technique is to crouch low through bending your back leg and to grab the opposite rail of the direction you are travelling. Grabbing the rail in this ‘pig dog’ stance whilst looking and pointing your leading arm in the direction of travel will give you a strong base to hold your line across the wave. *Pulling up on the outside rail gently with your hand will increase the angle that your board will trim. Pull too much and you will trim off and over the back of the wave. Learning how to preform carving turns is a big part of developing your surfing and will open up a wide range of new ways to maximise your time on a wave. 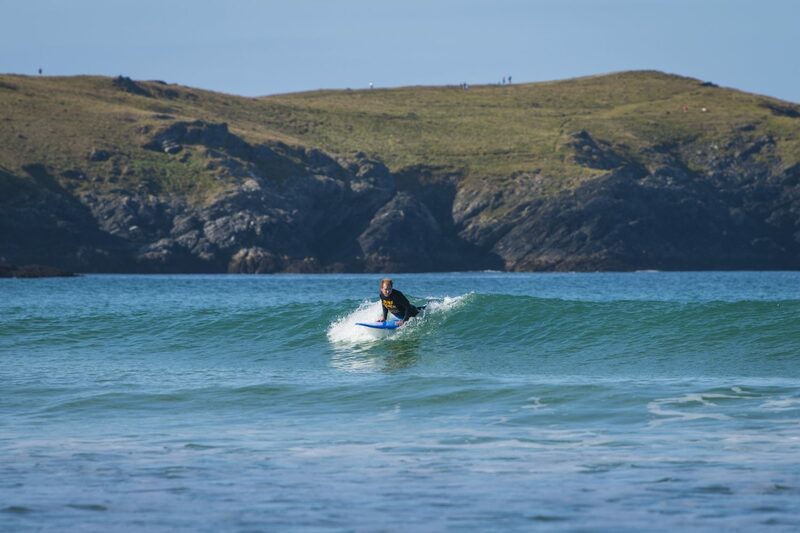 Carving turns allow the surfer to change direction quickly, set up for bottom turns and other functional manoeuvres, linking their surfing together to create fluid and seamless wave riding. HOW DO YOU DO CARVING TURNS? As with everything in surfing the right technique preformed in the correct part of the wave will result in a functional and smooth looking manoeuvre. Step one. As you travel along the wave face, position your board in the top third of the wave. Step two. Lean your truck weight over your back foot, simultaneously drop your weight into your hips, compress your body closer to the board and angle your weight over the side of the board that you wish to travel. *Make sure you have plenty of speed as you engage in the turn and that the majority of your weight is over the back third / fins of your board. Step three. It is important that you stay compressed and guide your turn by using your leading arm, trunk rotation and head to steer your body language and surfboard into the direction that you want to go. *Much like riding into a corner on your bike, it is the momentum and speed that you carry into and through the turn that will allow you to lean over your rail. Step four. As you start to travel in the new direction, bring your weight over your front foot once again and begin to extend your body in to your normal surfing stance. Hailed as the most important functional manoeuvre in surfing, a bottom turn will set up and decide the quality and availability of your next manoeuvre on each section of a wave. Depending on how the wave is forming ahead of you will decide on what manoeuvre will be possible for you to preform. This is linked directly to what type or strength of bottom turn you should aim to preform leading into your next manoeuvre. The description below is for new or developing surfers learning and understanding the basic elements required for how and when to preform a bottom turn. As you ride down the wave face look ahead and spot a position on the wave that will be suitable to place your bottom turn. Step One. As you begin to reach the bottom of the wave and your desired spot to place your bottom turn, simultaneously start to apply pressure on your toes and begin to lean your body weight over in the direction you wish to travel. Step Two. As you feel the rail of your surfboard engage with the wave start to apply lots of pressure to your back foot. Step Four. Use your leading arm to angle and rotate your trunk in the direction of travel. Make sure you look where you want to go. Step Three. In conjunction with step two. Once you have reached your previously eye’d place to preform your bottom turn you will need to start to extend your body out of the turn and up the wave face. At this stage the closer that you lean your chest to the wave the sharper and more vertical reaction the turn will have. Positioned correctly, a bottom turn will slingshot you into the next section of the wave and back up to the top third of the wave face ready for further manoeuvres.